About Marco Duarte, M.D. - Women's Cancer and Surgical Care, P.C. 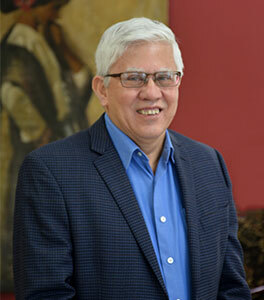 Dr. Marco A. Duarte, a native of Tucson Arizona, and graduate of University of Arizona College of Medicine has practiced medicine in New Mexico for 38 years. After completing a residency program in Obstetrics and Gynecology at Maricopa County General Hospital in Phoenix, Arizona, he and his family moved to Las Cruces, New Mexico. There he established a successful private practice. Dr. Duarte has always had an interest in the development of health careers for students from the Southwest. He was an instrumental member in the formation of the Med-Start Program at the Arizona College of Medicine in Tucson, Arizona. Many years later, as a faculty member at the Southern New Mexico Family Medicine Residency Program, his focus was on women’s health issues from 2007 until the end of 2017. He then joined Women’s Cancer and Surgical Care, P.C. Quality, patient centered care has always been the focus of his practice philosophy. His contribution to the formation of the Mesilla Valley Hospice Program in Las Cruces, and his early support of the Las Cruces First Step Women’s Health Center are both shining examples of how he puts his focus into practice. Over the years, Dr. Duarte had early engagement with Dr Luis Padilla- Paz, Dr . Joel Webb, and their now retired former colleague, Dr. Leo Twiggs. With the need for referral of patients with complex gynecologic and female cancer related concerns, these doctors were already working as a team for these issues. He noted that a significant portion of the patients traveling to the Albuquerque came from the Southern New Mexico, El Paso, and Chihuahua, Mexico region, thus recognizing the need for a committed professional in that area. Becoming associated with a group of dedicated, compassionate, and deeply competent like minded individuals at Women’s Cancer and Surgical Care, P.C. has been a unique opportunity. Being able to Bring the availability of this resource to El Paso and the Southern New Mexico communities is a privilege for Dr Duarte. He is thankful for his family, who have been his inspiration, and his patients of many years for their support. His goal, as a generalist Gynecologist, is to work with his patients and their primary care providers, to optimize their access to quality care. This is especially important in regard to women’s cancer issues – the prevention, diagnosis, timely and appropriate evolving treatment strategies being his main focus. In partnership with our regional resources, Dr. Duarte is bringing quality care to the El Paso area.